The big biking news this week is that the first phase of New York City’s Citi Bike bike share system will finally launch on May 27th to program members (and to everyone else the next week), and New Yorkers’ enthusiasm (and a little controversy) is mounting. Some New Yorkers, over 8,000 according to Transportation Commissioner Sadik-Kahn (with more than 4,000 of them in the first 24 hours), could not wait to start pedaling and have already signed up for annual memberships. Meanwhile, malcontents from across the City have spoken up in attempts to stop Citi Bike from rolling onto their blocks. Following initial delays from a malfunctioning electronic system, last fall’s Hurricane Sandy caused damage to some of the docking stations stored at the Brooklyn Navy Yard, forcing the DOT to delay and downsize the first phase of the program from 420 stations to 330 around Brooklyn and Manhattan. 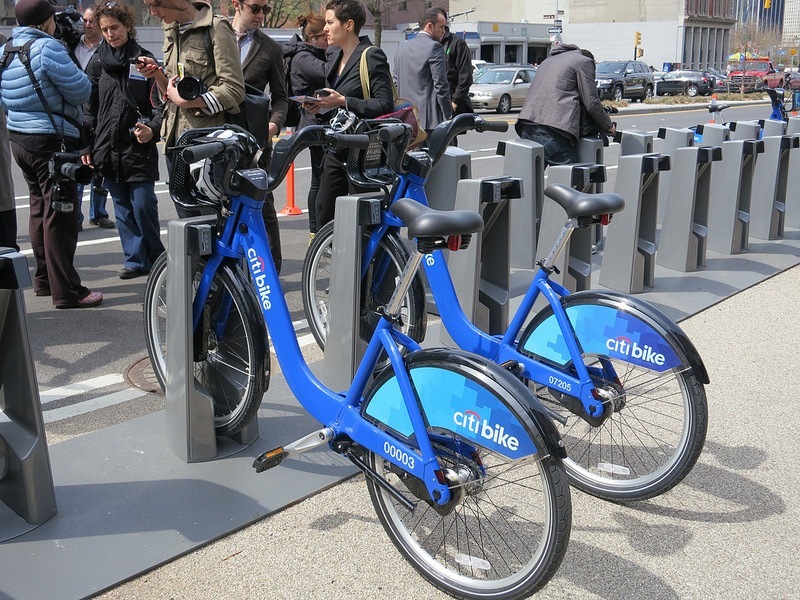 Once the second and third phases are rolled out, however, there will be a total of 600 stations and 10,000 bikes available throughout New York City, rounding out what will be North America’s largest bike share system. Not only will the system provide healthy transportation alternatives for thousands of New Yorkers, but it will also create 170 jobs and generate $36 million in economic activity annually, the NYC DOT claimed in a press release. Despite general enthusiam for the program, a few disgruntled citizens have been stirring up controversy throughout City. One outspoken Fort Greene resident recently pasted fliers on newly installed docking stations, claiming that Citi Bank advertising and commercial activity have no place landmarked residential blocks. In nearby Brooklyn Heights, the co-op at 150 Joralemon Street is bringing a lawsuit to the DOT for blocking their garbage collection. Meanwhile in TriBeCa, the New York Post reported that a lone restaurateur held a street-side sit-in to protest the installation of a bike station in front of his French Bistro. In the West Village, a co-op on Bank Street filed suit against the City after a station was installed directly in front of its entrance, citing it as a threat to public safety. While the suit was dropped, part of the bike rack was removed and replaced by a mysterious, massive stone bollard, WNYC reported. City Comptroller John Liu has also raised safety concerns, arguing for mandatory helmet laws in a press release. Liu also raised the issue that the bike share program could result in an increase of legal claims against the City, but overall, his message was positive. Bike advocates have been shooting down criticism of the program through social media, and the Brooklyn Spoke blog launched the tongue-in-cheek Bike Share Criticism Challenge taking aim at the most common criticisms. During the first week of operation, only those with a 95$ annual membership will be able to ride, but by June 2 daily and weekly passes will also be available. Check the station map to find the bike share station nearest you, and the price guide to see you’re your ride is going to cost you.